For previous 18-gamers, click here. After the Nats’ third straight loss to the O’s on Wednesday night, if you asked just about any fan about how the last 18 games have gone, the answer would likely have been “not very well.” And that certainly would be correct: 9-9 is the very definition of mediocre. But looking on the bright side, once again the Nats managed to avoid losing more than they won. And this was only the second time out of seven sets that they were not over .500. The tally for the year in 18-game sets is now 14-4, 9-9, 10-8, 10-8,11-7, 10-8, 9-9. Though it seems a long time ago, that hot start really is the gift that keeps on giving. The team started out 10 games over .500 and have just been creeping up, or holding steady, even since. So this was a hold steady set. After Game 126, with only 36 left to play, the team still was a solid 20 games over .500 — seven games ahead of the now Stanton-less Miami Marlins. They were also 10 games ahead of the sliding New York Mets, whose rotation seems to be in worse shape than ours, and whose season has to be seen as a disappointment as big if not bigger than the Nats’ 2015 season. At least we still had a fighting chance at the end of August last year, right? Scoring 5.4 runs per game, with 24 homers, and an OPS for the set of .789, the hitters did their part. The pitching, on the other hand, continued to be a question mark, and with Stras’s injury, it has now become a big question mark. Roark was again the rock of the rotation — the team won 3 of the 4 games he started. But it lost all three games that Stras started before he went down. Starts were made in this set by Reynaldo Lopez and A.J. Cole. It looks like we’ll see more of those guys even before the division is won. In this set, the pitchers gave up 5.4 runs per game, the same number scored by the hitters. I guess 9-9 was the most logical outcome. Nonetheless, there were certainly some moments worth recalling. Friday’s game was a solid effort. Gio gave up only two hits in seven innings of work. TVT and the Buffalo launched homers, and Mark Melancon, in his Nats Park debut, needed only 11 pitches to close out the 9th. The next night saw Stras going for his 16th win of the season, which would have tied JZnn’s team record. But he didn’t make it out of the 5th inning, a harbinger of bad things to come. The 7-1 loss was also the last appearance in a Nats uniform by one Jonathan Papelbon. See ya! Then, just two pitches later in the bottom of the inning, the Buffalo won the game with an opposite field homer, only the Nats’ second hit off of Bumgarner. Including the break between innings, that was about 3 minutes of the most sublime baseball for a Nats fan this year. Melancon closed the game out with a 13 pitch, 2 K save, his first as a Nat. Fresh off that exciting series victory, the Nats split a two game visit by the Cleveland Indians. In the first game, Max had a no hitter through 6 1/3 with 9 Ks, but the wheels came off in the seventh. The first hit, a botched pickoff, a double, a steal, and a single later, and Max and the Nats would lose a tough one and squander another web gem by Ben Revere. After two tough opponents, the Braves came to town. 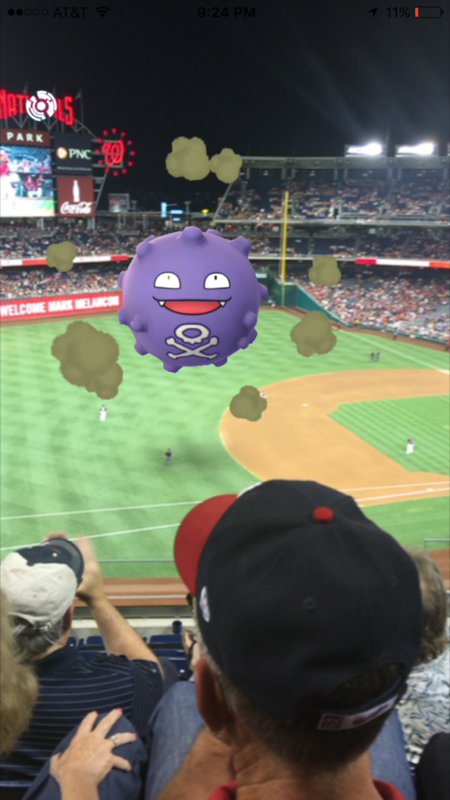 They seem to cure all ills for the Nats this year. After Stras labored through another loss, the Nats came back to take two straight. Turner and Murphy homered in the first victory, and Mark Melancon proved himself to be mortal, giving up two RBI hits before closing out a 7-6 win. Then the Nats exploded in a 9-1 win on Sunday afternoon behind another great seven inning outing for Tanner. Robinson, Revere, and Heisey all contributed. Then the Nats hit the road, stopping first in Denver where they lost 2 of 3 games. Most worrisome was Stras’s worst outing ever — 1 2/3 innings, 9 hits, 9 earned runs. He would be put on the DL before making his next start. The team then went to Atlanta to feast on the Braves again. Thank goodness for the Braves. Our season record against them is now 11-2. The first game featured a very nice seven inning outing from Reynaldo Lopez. So after taking 3 of 4 from a team they own, the Nats came north to play a home and home series against a team they decidedly don’t own — the Orioles. Four nights of watching alot of orange in the stands was not fun for Nats fans. Nor was seeing our pitching staff struggle in the first three games, which closed out this 18 game set. Even Tanner Roark got roughed up by the O’s. Ouch. The final game of the set did include a near miraculous comeback in the 9th, led by Daniel Murphy’s first career grand slam. The fight the Nats showed in that otherwise disappointing game was impressive. And it may very well have turned things around after four straight losses. What? You didn’t know Turner’s nickname was Speed Racer? Ladson has been trying to get that nickname attached to someone for half a decade after his crusade to rename the Shark failed miserably. But more important than Turner joining Dmitri Young in the pantheon of Nats record holders is his emergence as a singular threat at the top of the order, something the Nats have been lacking all year long. It’s fair to say that he’s been carrying the team since he started playing regularly, as his numbers for the last two 18 game sets show. Yes, his BABP is .408, but 35 starts is not that small a sample size. 53 hits? 14 steals? I know that projecting 37 games to a full 162 is meaningless, but this is just too much fun. How about 233 hits, 62 steals, 132 runs, 27 triples, and 18 HRs in a season? Insane. Oh, and he can do this. Two of our other big boppers showed some decline this set. Ramos was clearly tired by the end. Thank goodness he’s had a few days off recently. It does not look like Wilson is going to win a batting title this year. But his overall numbers are still very, very good, and he still hit some big homers in this set, including the game winner on August 7. When an .840 OPS in 16 games is a cause for concern, you know you’re dealing with a player who is having a special season. And he continues to get big hits at key moments. I commented the other day that there is no one I’d rather have at the plate with a man on third and less than two out than Daniel Murphy. Or with the bases loaded in the bottom of the 9th. Now Bryce. For some time we’ve been looking for signs of life. A good game here or there after that disastrous May series in Chicago brings calls of “Bryce is back,” but we’ve been disappointed time and time again. That’s one of the reasons I like the 18 game look in. Not quite the pace or power of April, and only 13 games since he returned to the lineup from a neck injury, but promising for September, and more importantly, October? I’d say so. At least we have reason for hope. This entry was posted in 18GameRecap, Analysis, DL, Harper, Murphy, Papelbon, Ramos, Roark, Scherzer, Strasburg, Turner. Bookmark the permalink.